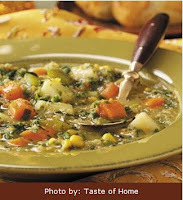 Here's a thick and creamy soup that combines a host of vegetables with herbs for unbeatable flavor. My sister made this for our family Christmas Eve and it is delicious! 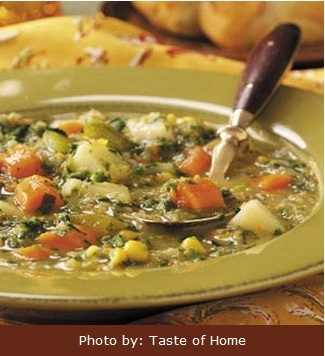 It is a nice change from the typical vegetable soup. Enjoy! 6 Servings Prep: 15 min. Cook: 25 min. the broth, potatoes, turnip, carrot, green pepper and seasonings. blender; return to the pan and heat through. Yield: 6 servings. Nutrition Facts: 1-1/3 cups equals 139 calories, 3 g fat (1 g saturated fat), 5 mg cholesterol, 788 mg sodium, 26 g carbohydrate, 6 g fiber, 7 g protein. Diabetic Exchanges: 2 vegetable, 1 starch, 1/2 fat. This recipe brought to you by Taste of Home.